Passengers who will be affected by the temporary closure of Newquay Airport in Cornwall may be able to get compensation from the local council. Up to 7,000 passengers face having to travel to and from other south west airports when Newquay closes at midnight for three weeks. The closure is so the owner, Cornwall County Council, can carry out work to the air traffic control system. The council said it would consider "legitimate" compensation claims. Councillor Andrew Mitchell, said: "I am sure there will be a case [for compensation]. "We will look at it sympathetically and also any legitimate claims from the public, we will be looking at our legal obligations. "As most of those people will be residents of Cornwall, and we're Cornwall County Council, we want to be fair and open with those passengers affected and the wider taxpayer in Cornwall." The council is also funding free shuttle buses to take passengers to and from the other airports handling rescheduled flights. 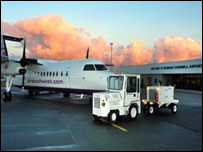 Those include Plymouth Airport in Devon and Lands End Airport in Cornwall. The county council is due to take over air traffic operations from the RAF, which is pulling out of the adjacent RAF St Mawgan airbase, at midnight. But it has had to cancel flights after failing to complete work needed to secure a licence from the Civil Aviation Authority (CAA) in time. The council hopes to meet CAA requirements and get a licence by 19 December.